Today on the blog we have an interview with Ryan Weiss, owner, artist, and designer for RockEverywear, an Ohio-based fashion company and Akron's First and Only FashionTruck! Recently, Ryan was in the news for designing, creating, and donating a custom designed helmet for Rowan, a young neighbor recently fitted with a corrective helmet. We love this story and wanted to share it with our blog readers, too. Ryan graciously answered some interview questions for us... read on for more about this cool cranio collaboration. What helmet? Look at that beard!! CCA: How did you learn about the opportunity to make Rowan the coolest custom helmet ever? RE: A friend of the family familiar with our work told Rowan's parents about us and suggested they reach out to me about the possibility of doing a helmet for them. 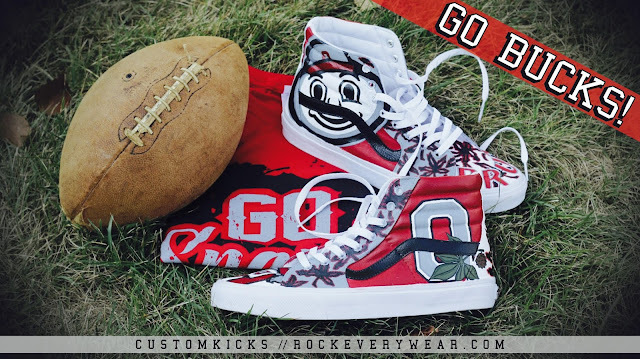 I do custom shoes and had recently done a pair of Ohio State ones. They loved the shoes and thought that maybe I could create a helmet similar to those. CCA: What part of the story moved you to act? RE: I understand how the generic white helmet can be unappealing. If he was going to have to wear the helmet as often as he does I figured I'd love to make him something more fashionable and with it beginning the football season what better time and theme! CCA: What did you learn from the experience? RE: Upon completion of the helmet I delivered it to the family myself and hung out with Rowan and talked to the parents about his condition. It was something I never knew about and had never really noticed any children wearing the helmets. The mother explained to me what caused the issue for them and how the helmet will aid in the development of his skull structure and sustain him from further flattening any particular portion of his head. It was cool to be able to help them out and learn about something new that we are able to continue to try and make more people aware of and do what we can to help. RE: With Rockeverywear and our mobile clothing store (aka FashionTruck) I love being able to travel all over Ohio to different events and venues to set up and meet new people. It gives us a great opportunity to meet as many new people as we'd like by doing all sorts of events! I have a deep passion for music so I'd say my favorite part is all the cool music festivals we travel to to set up at. We did Warped Tour and Fashion Meets Music Festival this summer and they were awesome events. CCA: Millenials - us and "approximately us" - have a different mindset on philanthropy ... you demonstrate that with your desire to make more helmets like Rowan's. What's your philosophy on "giving back?" RE: A pretty solid part of starting Rockeverywear was to be able to interact in my community of Akron, Ohio and be able to shed a positive light on what this city has to offer. By doing so we connect with many different businesses and organizations which allows us to do fundraisers and events alike to raise money and awareness for different causes. Being able to turn a passion of mine into a format that allows us to help those in need is a really great feeling. We offer what we call a 'Homeless Care Kit' [ www.rockeverywear.com/product/homeless-care-kit-donation ] which people can donate to through our website and we assemble packages of different hygiene products and food and such to help those in need. We keep them stocked on the FashionTruck and I even keep them in my car and I'll give them out randomly to people I see that seem in need. That's just one of the ways we aid in giving back. We also have Random Act Of Kindness cards that we keep in a business card holder on the outside of our truck. These cards are to encourage others to give selflessly expecting nothing in return. CCA: If you could tell Kid Ryan one piece of advice, what would it be? RE: Do what makes you happy! CCA: How do you defeat self-doubt as an artist/creator/entrepreneur? RE: This is something I still struggle with to this day! You just have to be confident and believe in what you create. If you can't stand behind your work then it's hard to expect others to. Being a small business owner has obstacles of its own. You have to be unique in what you do enough to stand out from others. It's a lot of commitment. But if it's your passion to be an artist and to work for yourself then it's worth the risks and time. CCA: If you could have one super power - other than mad art skills - what would it be? RE: Freedom of time & money! I'm not sure if that's a super power! But I would love to be independently wealthy so I could spend more time volunteering and giving back to others more often. CCA: What's the change you hope to see in the world? 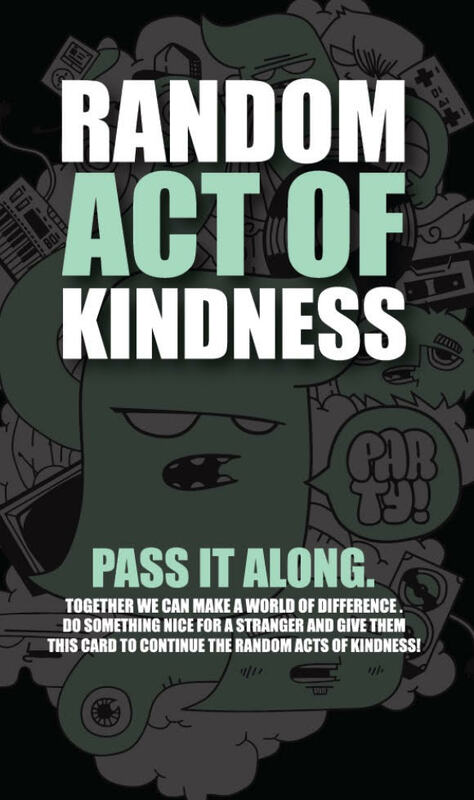 RE: I'd love to see more people willing to give back. More volunteering and selfless acts of kindness. Thanks, Ryan for answering our questions and having such a giving heart.